Today I am thrilled to be posting the Guest DT project for Desmet Designs . Celebration in RED, WHITE and BLUE is the theme and what a lot of great ideas and inspiration from the DT . I chose the quintessential emblem for England...The Rose. I decide to make a clean and simple card to make sure the Rose took centre stage. I used my favourite Tombow water-based makers to colour the rose and mounted it onto a scalloped oval from Nellie Snellen. Using demesional adhesive pad I popped the oval onto a rectangle of white card with the corners decorated. A blue organza ribbon was wrapped round the with card and tied in a bow to add a bit of interest. 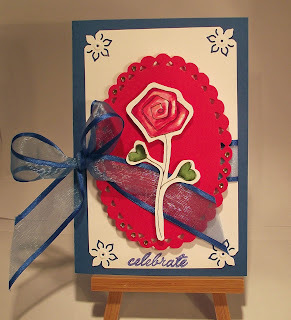 To finish the completed imaged was matted to the front of a Royal Blue cards and the sentiment 'Celebrate' was stamped with a Fiskars stamp on the bottom of the card. Check out the Desmet Designs challenge blog and see the great designs from the DT team. Thanks again for stopping by to read my blog. I welcome your visits and look forward to your comments. Gorgeous card Angela, loving the flower.